Brian Dixon, PhD, MPA, FHIMSS, and his co-investigators are conducting the first study of health information exchange use over multiple years to evaluate whether it improves patient outcomes in emergency departments. The innovative work will measure actual use of health information exchange over time, across multiple institutions, to generate high-quality evidence of the value and benefit of health information exchange, or HIE, in the delivery of emergency care. The research is supported by a two-year award from the Agency for Healthcare Research and Quality. Dr. Yi Wang Interviewed by Indianapolis Star for "Does Indy's land use plan protect the city's vulnerable communities?" Yi Wang, PhD, assistant professor in Environmental Health Science Departmnet, was interviewed by the IndyStar for the story "Does Indy's land use plan protect the city's vulnerable communities?" Dr. Wang was struck by the plan's emphasis on wellbeing and inclusivity for Marion County residents but felt it was inconsistent without also including mentions of equity among the communities — such as how close they are to landfills, highways or public parks. Max Jacobo Moreno, PhD, assistant professor in the Environmental Health Science Department, was recently awarded a grant from the Indiana Space Grant Consortium (INSGC). Dr. Moreno is co-PI on the project "A Novel Approach to Exploring Mosquito Populations and Associated Disease Risk in Indiana" along with PI Daniel Johnson. This project is a pilot project to downscale satellite imagery with high resolution imagery from unmanned aerial vehicle (UAV) to identify areas suitable for mosquito breeding and associated diseases risk. The INSGC is a non-profit organization that strive for expanding opportunities for the people of Indiana to learn about and participate in NASA's activities. 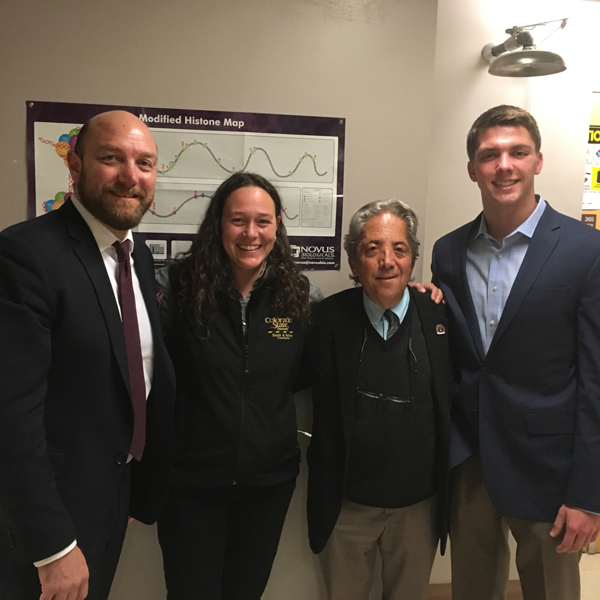 Last week, Steven Lacey, PhD, CIH, CSP, visited with the AIHA Rocky Mountain Section in Colorado to meet with lawmakers regarding young worker health and safety. Among meeting attendees was Mr. Sampson Briggs (pictured, right). In the summer after graduation from high school, Sampson was working as a construction helper to earn money before going off to college. In the course of this work, he suffered a 30 foot fall, fracturing his skull and every bone in his face, among other injuries. After a long, remarkable recovery, he is now a sophomore in college, and a speaker and advocate for workplace safety. "The AIHA-NIOSH partnership on Safety Matters aims to help prevent these devastating injuries through workplace health and safety awareness training for young people – well before they show up to a job site." "It's an honor to work with the Rocky Mountain Section to help lead a sustained, national policy effort to deliver public health impact through service to the profession," Dr. Lacey said. Ordinary citizens learn how to use Nalaxone and take it home to potentially save a life. Dr. Watson discussed the results of his postcard survey, "We've gotten cards back from people who've saved a life. We've gotten cards back from the people who've actually had their life saved because people again will write 'this saved my life’ on the cards, ‘thank you.’ We've gotten those written in the margins." The IUPUI Center for Translating Research offers the opportunity to engage with several of IUPUI’S distinguished faculty scholars as they present their translational research and illustrate how they improve people’s lives at the IUPUI Center for Translating Research into Practice (TRIP) Community Showcase. TRIP scholars have partnered with community and business partners to translate their research into viable practices that improve our communities. Come see how their work is making life better in our city, state, and world. Marcie L. Memmer has been named director of the Center for Public Health Practice (CPHP). She was previously the director of the Division of Nutrition and Physical Activity (DNPA) for the Indiana State Department of Health (ISDH). During her time at ISDH, she also served in other roles including program coordinator of Communities and Families for the DNPA and Manager for the Asthma Program. Previously, she spent three years working for the Georgia Department of Human Resources, Division of Public Health, Childhood Lead Poisoning Prevention Program. She has her MPH from Emory University, Rollins School of Public Health. She is also C.H.E.S. Marcie returned to Indiana this summer after living in Switzerland with her family for the past three and half years. She’s thrilled to be an active member of Indiana’s public health community again. Andrea Janota has been named program coordinator of the CPHP. Andrea completed her Bachelors of Science in Public Health at Saint Louis University with focuses in Spanish and International Relations. Andrea received her Masters of Public Health with a concentration in Global Health from Boston University. Andrea has experience working in local government and with medical institutions in Boston. Her work has centered around food economies, community development, and youth empowerment. In her free time, Andrea enjoys training for marathons and rooting for the Chicago Cubs. Two Life-Health Sciences Interns are supporting the work of the CPHP too. Karly Jones is a junior from Warsaw, Indiana, majoring in Health and Rehabilitation Sciences and minoring in Psychology. She’s super excited to study and work in public health. She looks forward to learning more about the CPHP and being a part of its work. She’s also involved with the CPHP Public Health Corps, Order of Omega, Delta Zeta, and Best Buddies. In her free time, she likes to spend time with friends and family, go to new restaurants, the lake, adventure around parks and trails, and go shopping. Carrington Davis is a sophomore, majoring is Health Services Management. She’s originally from Southern Illinois. In addition to being an intern for CPHP, she also participates in the CPPH Public Health Corps, and is secretary for Alpha Lambda Delta and Phi Eta Sigma (ALD/PES) and the Social Media Coordinator for Black Student Union. In her free time, she enjoys spending time with her friends and family. Marcie, Andrea, Karly, and Carrington, along with the guidance and leadership of Dr. Duwve (Associate Professor and Associate Dean of Public Health Practice), are eager to meet all the FSPH faculty and staff, learn more about the research and activities, and identify opportunities to work together. Two Fairbanks School of Public Health students received recognition at the Indiana Public Health Association annual dinner on October 19, 2017. MPH-HPM student Ben Gonzales received the Dr. Helen L. Scheibner Life Science and Public Health Scholarship. The purpose of the scholarship program is to promote student interest in Life Science and Public Health by offering financial assistance to encourage and facilitate the pursuit of a professional career in these fields. MPH-EHS student Angelie Kasman received the the Stephen Jay Award for Leadership. This award is presented to an MPH student who exhibits exemplary public health leadership, scholarship, and practice resulting in the improvement of public health in Indiana. The eastside suburb of Irvington boasts one of Indianapolis’s more storied histories. This walking tour will acquaint you with the neighborhood’s distinctive architecture and recount stories that will inform, uplift, and intrigue. Bring your walking shoes and a cell phone or camera—you may want to take snaps for posterity! Our guide is Paul Diebold, BA ’84, author of an architectural history of the neighborhood and an Irvington resident for 25 years. Registration for the tour is at Black Acre Brewery, where we will return afterward for refreshments. Walking tour | 6:30–8 p.m.
Indiana University students and employees on all IU-administered campuses will be practicing the appropriate response during an earthquake as part of the Great Central U .S. Shakeout on an alternate date this year due to major event conflicts. IU will participate at 10:26 a.m. EDT on 10/26/2017, except IU Northwest, which will participate at 10:26 a.m. CDT. IU is at the crossroads of two significant seismic zones, making it imperative that everybody participate in the drill. In advance of the drill, please review the procedures at the link below so that you know what to do. Please use the time during the 15-minute drill to practice and discuss what you would need to do during an earthquake. An IU-Notify message will begin the drill around 10:26 a.m., with messages sent to text, email, desktops, social media, webpages and digital signs, but not including voice calls to telephones. The drill is expected to last 10-15 minutes. An “All clear” IU-Notify message will indicate the end of the drill. Directions for how you should Drop, Cover and Hold On can be found on the Protect IU website, https://protect.iu.edu/emergency-planning/procedures/earthquakes.html. During an earthquake, it is important to stay where you are and to seek cover under something sturdy. If inside, stay inside. The purpose of a drill is to discover information gaps – what you do not know – so that corrective steps can be taken. You will be able to share feedback about the drill in a survey that will be available in the email delivery of the IU Notify Drill alert. Read more about the IU ShakeOut and IU’s earthquake preparations here: https://protect.iu.edu/news/iu/2017/10-17-iushakeout.html. Read more about the Great Central U.S. Shakeout here: http://www.shakeout.org/centralus/. Join Dr. Tyler VanderWeele for the Presentation "Sensitivity Analysis in Observational Research: Introducing the E-value"
Sensitivity analysis can be useful in assessing how robust associations are to potential unmeasured or uncontrolled confounding. We introduce a new measure that we call the “E-value,” a measure related to the evidence for causality in observational studies, when they are potentially subject to confounding. The E-value is defined as the minimum strength of association on the risk ratio scale that an unmeasured confounder would need to have with both the treatment and the outcome to fully explain away a specific treatment-outcome association, conditional on the measured covariates. A large E-value implies considerable unmeasured confounding would be needed to explain away an effect estimate. A small E-value implies little unmeasured confounding would be needed to explain away an effect estimate. We propose that in all observational studies intended to produce evidence for causality, the E-value be reported, or some other sensitivity analysis be used. We suggest calculating the E-value for both the observed association estimate (after adjustments for measured confounders) and for the limit of the confidence interval closest to the null. If this were to become standard practice, the ability of the scientific community to assess evidence from observational studies would be improved considerably, and ultimately, science would be strengthened. Send abstract to oaa@iupui.edu. Abstracts are due via email by 8 a.m. on Monday, October 30, 2017. The selection committee will notify you by email if the abstract is being accepted or rejected no later than Friday, November 17, 2017. Abstracts that do not adhere to the structure requirements will not be considered for presentation during the Institute. Only abstracts fully accepted by the selection committee and adhering to the abstract requirements will appear in the program. Students or faculty working on team projects should submit only one abstract for the entire group, unless they are representing distinct, complete pieces of work undertaken by the team. Student and staff researchers must seek guidance from their mentors in preparing the abstract(s). Faculty mentors must review staff and student abstracts before they are submitted for consideration to be presented and appear in the program.